One of the most frequently requested workflows is the Recurring Webinar. Quite a few Marketo clients setup recurring webinars for product demos (especially all your SaaS firms) and want to route the registration through Marketo. This makes perfect sense and it is very possible to do this. GTW and WebEx do not support recurring webinars with Marketo. Just not going to happen. You need 1 Program for every single time you run the recurring webinar. It is always a 1-1 relationship. Please do not try to circumvent this. The reason is once you connect a webinar to a Program, it is very difficult to change it. The other reason is you will have bad data for your reports. All you would see is "1000 attendees" for the demo webinar---for all time. This makes no sense. What Marketo does do is give you the tools to support a recurring webinar yourself. Most of the time, there is a single page for registration and a list of dates the lead can sign up to. In the past, this form spit out a list to you and you registered the people with the right events. 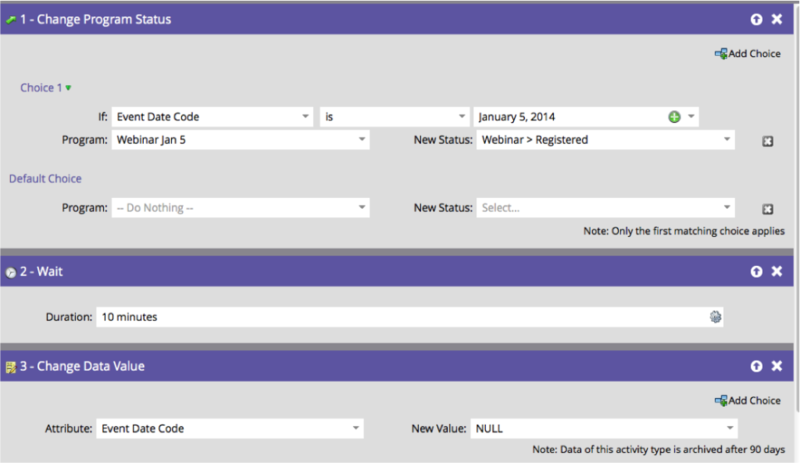 The standard way of handling webinars in Marketo is to create a single Webinar Program, then build or clone the related assets, and put up a single registration page - one for each webinar. Usually the lead or customer is asked to choose one of several dates to join. Yes, you still need a 1-1 match between a webinar and a Webinar Program.This can be done for Roadshows and Webinars with the same process. In this example, we will use a Webinar. Here is the basic workflow we will build. 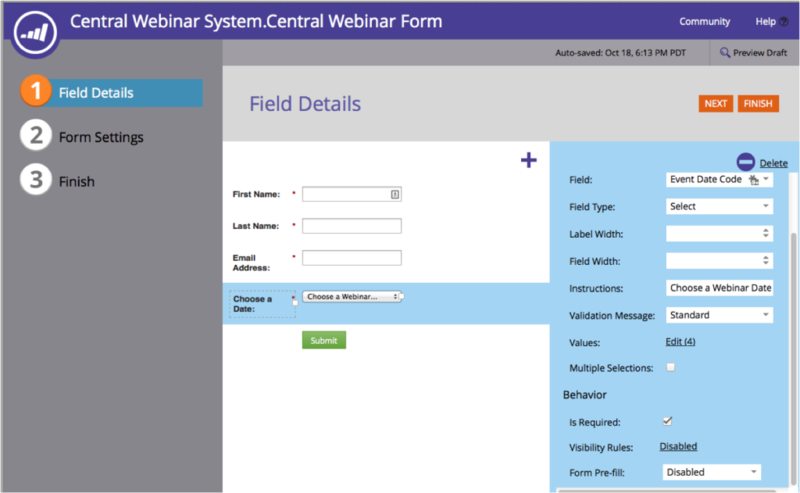 The recurring webinar system first requires you to create a custom field in Marketo. Go to Admin > Field Management > Custom Field. Now, if we want to display the date on the thank you page, we will have to use the natural language as the code, e.g. : January 5, 2014. This is fine, but there could be some limitations if we try to do fancier things later on. Change Program Status for the target Program. Request Campaign – request the target’s registration campaign flow. Both systems work just fine and require the same amount of work to update for new events. I will show you both systems. Option 1: Change Program StatusIn this system, we are listening for the Form Fill Out on the main page. We must also make sure the Event Date Code IS NOT EMPTY, or our plans will fail. 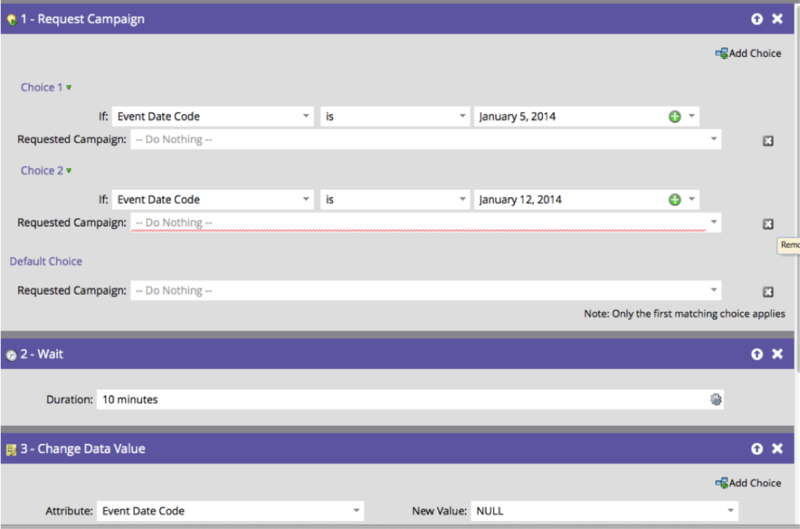 Change Program Status in the target Program based on the Event Date Code. Reset the Event Date Code field so that if the lead shows up next time, prefill won’t mess up their next request). The next step is within each Target Program: the Confirmation Trigger will listen for the Program Status is Changed in this Program to “Registered.” If we want, we can ensure the right Event Date Code is used. This brake isn’t necessary, but it might prevent errors if someone accidentally changed the status. The flow is simply to Send the Email because we’ve already set the webinar Status to Registered.Option 2: Request CampaignAgain, in this system, we are listening for the Form Fill Out on the main page. We must also make sure the Event Date Code IS NOT EMPTY.In the main registration processor, the difference is just that we use Request Campaign to call the target Program’s registration flow. 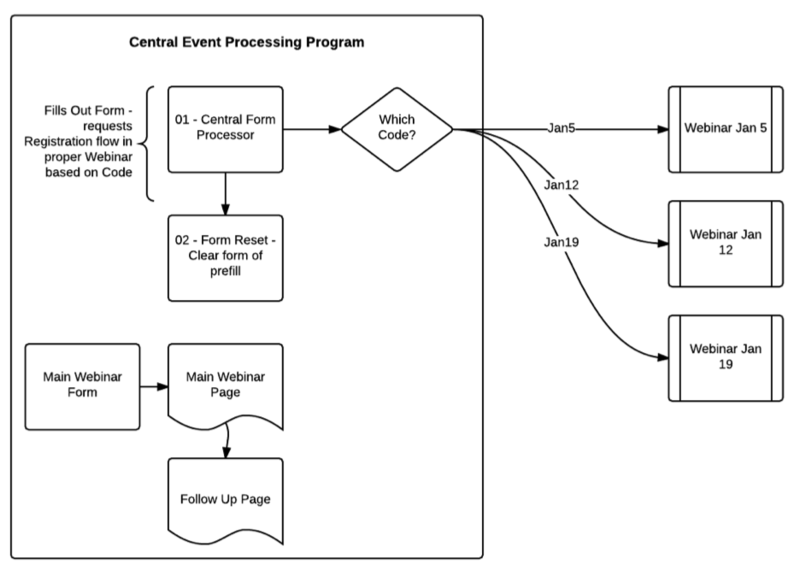 Option 2: Requested Webinar RegistrationIn the target Program, the Confirmation flow listens for the Campaign is Requested and Event Date Code. The flow then does Change Program Status and Send Email. 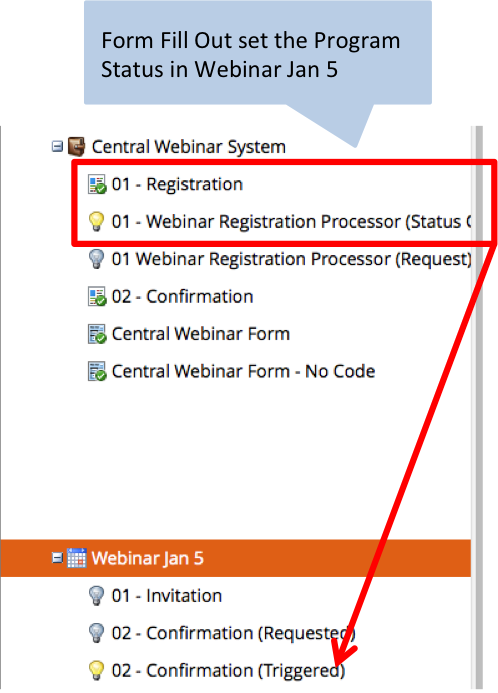 If you are used to having the Change Program Status within the target Webinar, then I recommend just keeping this the same in your Program Template.Either system will work! Form SetupNow that we have a Program, we can create a Form. Add the fields you wish to have filled in, but also add the Event Date Field. For the Thank You Page, we might want to display the Lead’s choice on the page. The only way to do that is if you chose to keep the standard Date format instead of using the date code system. Approvals and ActivationNow you can approve the pages and turn on the target Confirmation flows, then the Webinar Registration Processor. Go ahead and give a whirl. Let’s say you had four recurring webinars each month. You would use these steps to update the Form and central flows. 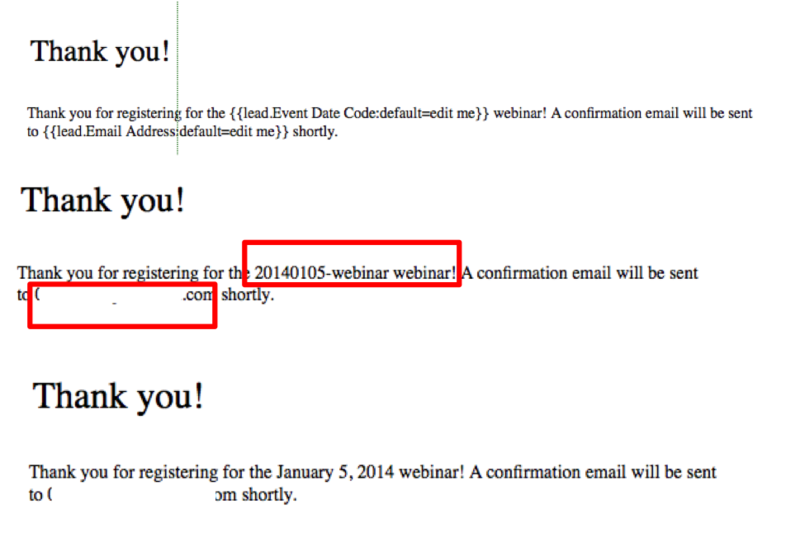 Setup the recurring webinars in GotoWebinar. These must be separate webinars. Setup the Marketo Webinar Programs and connect them to GTW. Use a Program Template here. Decide on the Event Date Code. Make sure your target Programs’ registration flows are activated. Central System: Update the Form with the new codes and dates. Recurring Webinar Idea - vote! There are quite a few threads on this topic, so please do a search if you want to know more. I owe a lot to earlier threads, but the links have disappeared.